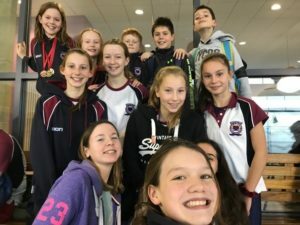 For many swimmers it was their very first external gala which was very exciting for them. Olivia McDonald told me that this was one of her first galas and then she said “It is good and it is competitive”. There were events in all the strokes and an Individual Medley as well, split between boys and girls and the following age categories: 8yrs and under, 9-10yrs, 11-12yrs, 13-14yrs, 15/over. Chatting to some of the Hearts swimmers, I found that many of them have a favourite stroke. 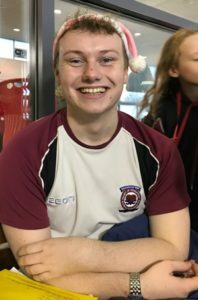 I asked some of them why; Josh El stated “Breaststroke because I’m fast at it”; Adam Funnell commented “Butterfly because I’m good at it”; and Layla Wedderspoon told us “Butterfly because it just is”. I also spoke to some of the spectators. Julie Robb told me “All three of my children are swimming today. It’s a great sport for keeping fit and competing has given my kids loads of confidence. Louis loves being with his friends and cheering his team mates on. I then spoke to some of our wonderful Hearts officials who told me why they volunteer to help at galas. 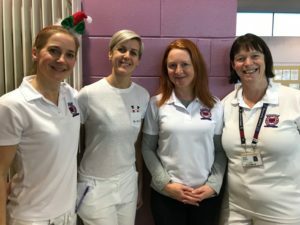 “they give you sweets”, said Mel McDonald, “I enjoy chatting to the other officials”, said Carol MacInnes, “You get the best view of the swimmers when you are on poolside”, said Angie Doney. Everyone seemed to enjoy the festive atmosphere of the day and a number of swimmers took places on the podium.